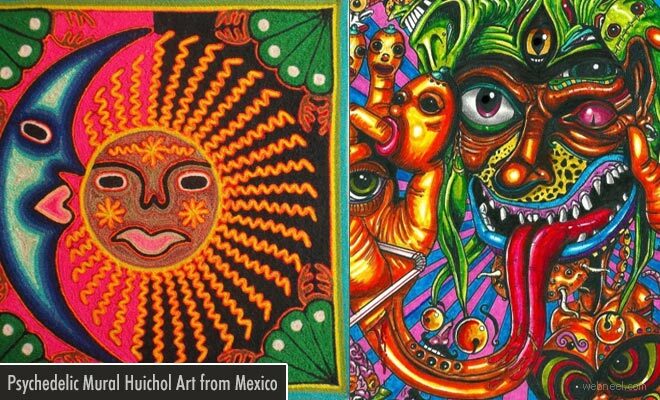 Massive Mural Huichol Art: Huichol Art is from Mexico. Massive Mural Huichol Art is usually made from yarn and beads. According to Wikipedia,"Yarn paintings consist of commercial yarn pressed into boards coated with wax and resin and are derived from a ceremonial tablet called a neirika. The Huichol have a long history of beading, making the beads from clay, shells, corals, seeds and more and using them to make jewelry and to decorate bowls and other items. The modern beadwork usually consists of masks and wood sculptures covered in small, brightly colored commercial beads fastened with wax and resin. These have replaced many of the traditional materials such as clay, stone and vegetable dyes".